Fog-bound Victorian London is the setting for Patrick Hamilton’s Gaslight (Angel Street). As a 1941 Broadway hit first under the title Angel Street and twice made into a film as Gaslight, Gaslight remains one of the longest-running non-musicals in history. The play is set in 1880 at the lower middle-class home of Bella Manningham (Charlotte Trant) and her husband Jack (Greg Tsigaridas). It is late afternoon “before the feeble dawn of gaslight and tea” and Bella is clearly on edge. Jack, a suavely sinister and handsome man, is slowly torturing his gentle, beautiful wife into insanity under the guise of kindness. Bella, however, is most troubled by her husband’s unexplained disappearances from their home. One day, while Jack is out Bella, has an unexpected visitor, the amiable and paternal Inspector Rough (Billy Tucker). As a policeman, he convinces Bella that her husband is not the gentleman he appears to be, but a man hiding secrets from his past. She gains confidence in herself as she and the inspector work together to build up evidence against Jack. The cast also includes the young maid Nancy (Sarabeth Roberts), the subservient and loyal Elizabeth (Mary Jo Stockton), and cop (Krishon Preston). Don Blaheta will direct the production that has been described as one of the greatest psychological thrillers ever made. He is assisted by Moffatt Evans (set designer), Hannah Boswell (stage manager), Kolby Grimsley (costume designer), and Scott Chapman (light designer). 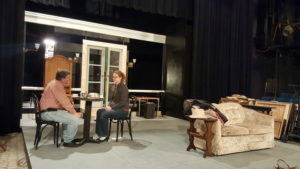 The show runs April 13, 14, 20, and 21 at 8 pm. For more information or to volunteer, contact the Waterworks Players by email at info@waterworksplayers.org. Reserved Tickets are $12. Opening night of April 13 is wine night, $16 for a ticket and first glass of wine. Tickets can be purchased online at http://waterworksplayers.org/buytickets or call 434-392-3452.